Produced by the Mermaid Theatre of Nova Scotia, The Very Hungry Caterpillar and Other Eric Carle Favorites is simply exquisite. My co-reviewer (and daughter), entranced, simply nodded when I asked her during the first story if she liked it. Known for “its innovative and visually spectacular puppetry and lighting designs,” the Mermaid Theatre of Nova Scotia has performed for nearly 5 million playgoers on 4 continents. The sets and characters are vividly contrasted against a black backdrop and rendered luminescent under black lights. Gordon Pinsent’s baritone hovers at the edges of the puppets, narrating the characters’ inner worlds. Starting with LIttle Cloud, Jonny Thompson and Maria Zigler elegantly wrestle clouds and landscape across the black. Little Cloud transforms into shapes as disparate as a clown and sheep, morphing into life like optical illusions. The music by Steven Naylor completes the emotional life of the stories, which are both playful and dramatic. The familiar tale of Very Hungry Caterpillar earned the approving murmurs of the audience, a bit like concert goers singing along with a familiar hit. 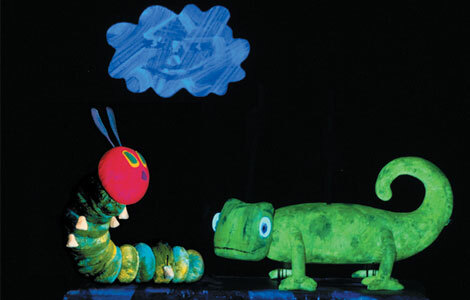 After the performance, Thompson and Zigler came onto the stage under raised lights to answer questions and show the tricks employed to make the caterpillar fatten and the cocoon grow. Sets were spun around to show the ropes and curtains. Thompson and Zigler explained how mudane materials had been made magical. A wonderful and imaginative production, The Very Hungry Caterpillar and Other Eric Carle Favorites is ideal for younger kids. The action and characters provide excellent opportunities for discussions about change and self acceptance and the celebration of what is different and new. And, as part of CTC’s ‘ACT One’ commitment to creating a more accessible, diverse, and inclusive culture, CTC offers their first-ever Sensory Friendly performance as well as shows performed in Spanish and French. The Very Hungry Caterpillar and Other Eric Carle Favorites. Presented by the Children’s Theatre, January 14-February 23. Information at www.childrenstheatre.org.